This colorful, sweet yet savory salad might just be my perfect summer salad. The cold cucumber with little bursts of chilled watermelon makes the hot days just not seem so miserable. 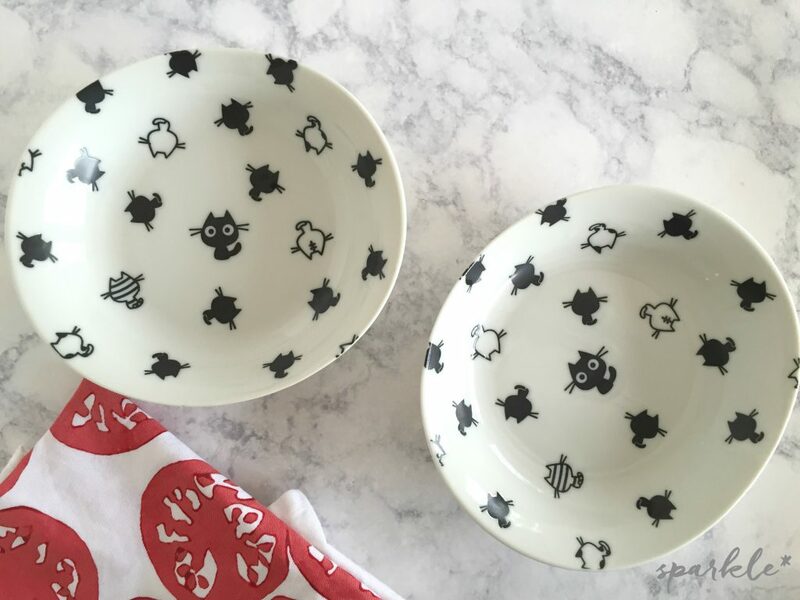 You have to check out these adorable bowls I picked up at TJ Maxx for the girls. They have these cute little cats on them. Cats seem to be a theme this week. Of course they are made in Japan. I really want to go to Japan and shop for all kinds of cute stuff. Well the girls were at school today when I was making this salad and I decided to use their bowls, cause you know what they say…When the cat’s away… Ok, enough cat talk. 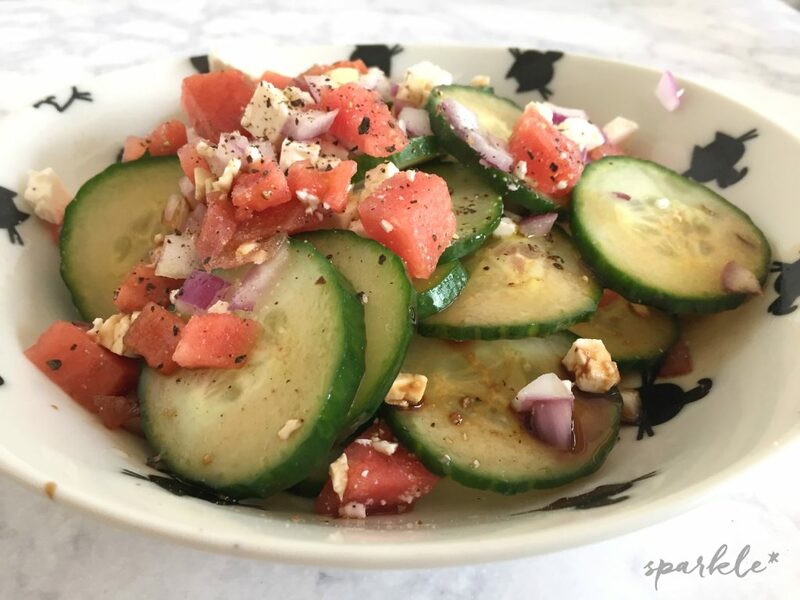 The salad is really simple, thinly sliced English cucumber, diced watermelon, diced red onion, fresh feta, olive oil, balsamic vinegar and freshly cracked pepper. Toss it all together and your done. I love this salad cold, cold so I always chill the watermelon prior to cutting it. Toss all ingredients together. Serve chilled. 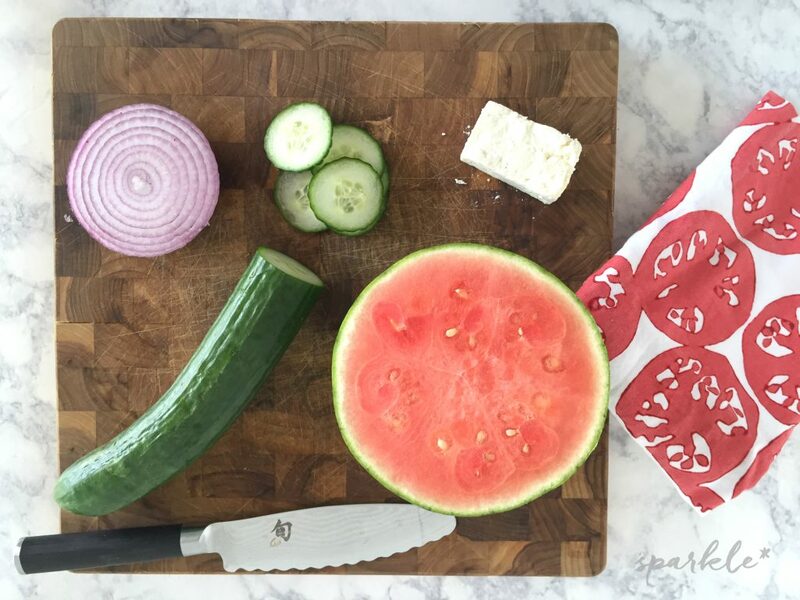 I just love how the sweetness of the watermelon combines with the saltiness of the feta. Tell me, what is your favorite summer salad? Linked to these great parties! 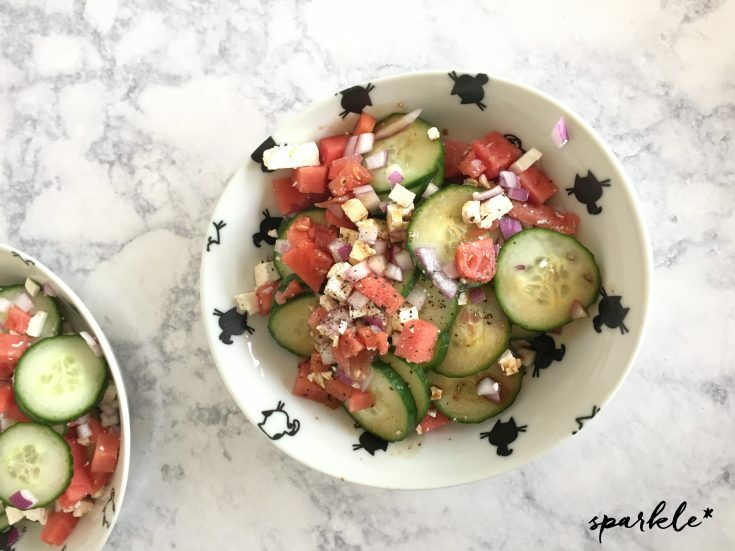 Oh how I love feta and can’t wait to try this salad for our first summer cookout party! Thank you so much for the inspiration! This salad looks delightful! I can not wait to try it! Thank you so much for sharing your recipe with us this week at Snickerdoodle Sunday! Yummy. This looks like an amzing summer treat. I bet the watermellon adds a nice touch. This sals is so many of my favorite things… together! I can’t wait to make it this summer. I love the idea of this combination! I wouldn’t have put it together myself, but it sounds so yummy and “summery!” Pinning! What a yum-looking salad, and I adore how you styled it in the pretty bowls. I love the cute bowls I come across at both TJMax and Marshall’s (see my blue bowls, many from those stores, featured here: http://gingerwroot.com/blue-and-white-bowls/ Can’t wait to try this recipe! Sounds like a really yummy salad. I have a watermelon I should pick up cucumbers and feta and try this. Thanks for sharing at the Inspiration Spotlight party. Shared. See you again soon. one of my favorite salads! Thanks for sharing on the What’s for Dinner link up! This is a delicious salad that we will really enjoy! Thanks so much for sharing with Full Plate Thursday and come back to see us real soon! Yum, yum, yum, that it’s such a great recipe! You’re most welcome to drop by for a cup of inspiration! This looks good and refreshing for those hot summer days sure to come here shortly. I love all the ingredients! 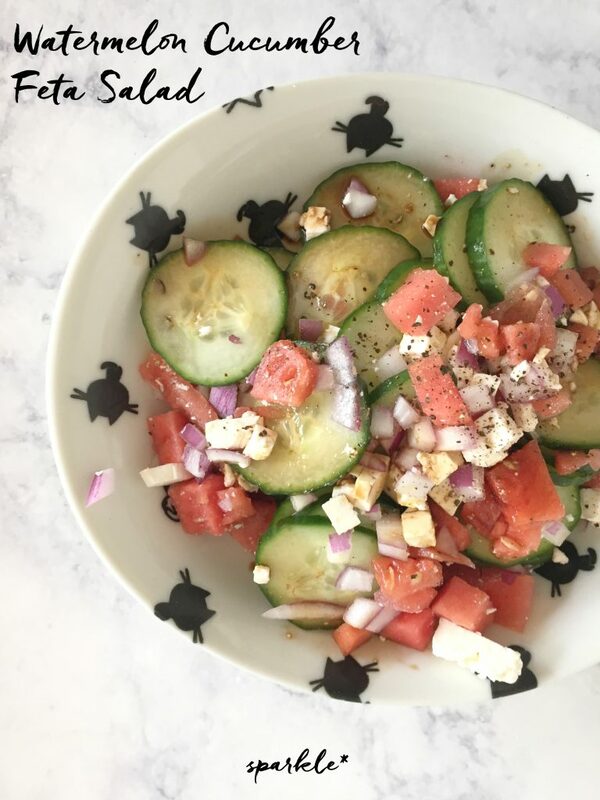 I love watermelon and a watermelon salad sounds delish and refreshing. Thank you for sharing at Tasty Tuesdays. I would never have thought to mix these ingredients together but it really sounds refreshing and delicious! Thank you for sharing this week at our Encouraging Hearts & Home Blog Hop. I’m stopping by from #SaturdaySharefest. I enjoyed this post and can’t wait to try this dish. I LOVE watermelon!! That sounds refreshing! Thanks so much for sharing with us at the Summer Time Fun Linky party. Pinned.